Internet Saathi – Digital Literacy Programme is a collaborative project with Tata Trusts, PMG and PHIA Foundation implemented by Deshkal Society as a pilot project in 96 villages of Korha block of Katihar district initiated in June 2017. The key objective of the project to eliminate gender digital divide and equip women with digital skills in order to ensure participation of women in the digital economy. Soon the project would be upscaled for outreach in 15 blocks, 1251 revenue villages in Kathar district of Bihar having 302 Internet Saathis in order to make 2 lakhs women aware of internet benefits enhancing their overall quality of life. Generate awareness on issues around education, health, and sanitation. Train women on digital transactions including various options available for making cashless payments in line with the Government of India's digital drive initiative. 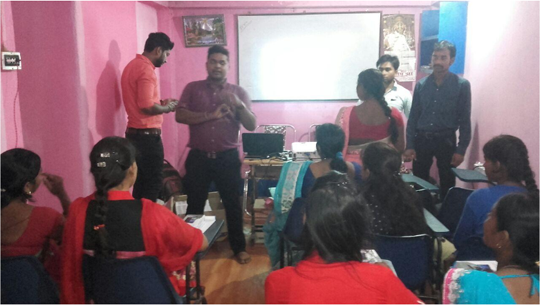 The pilot project commenced with an orientation workshop and training programme for the project coordinators and master trainer, known as "saathis" held on 27 - 28 July, 2017 in Katihar. The training programme included use of an awareness module, coupled with hands - on training modules aimed at teaching women on use of the Internet through hand held mobile devices and tablets. Each Internet Saathi was provided with a tablet, a smartphone and a learning kit. In the backdrop of this, it is significant to know that the growth of internet users in rural India presents a skewed picture with male users number growing at the rate of 57 per cent while among females, the rate of growth is not more than 27 per cent. Therefore, women are further at the risk of lagging behind if they do not have operational knowledge of the digital technology and its use through handheld devices at a time when government of India plans to have 100 percent access to the digital services through use of applications as part of the Digital India Programme.